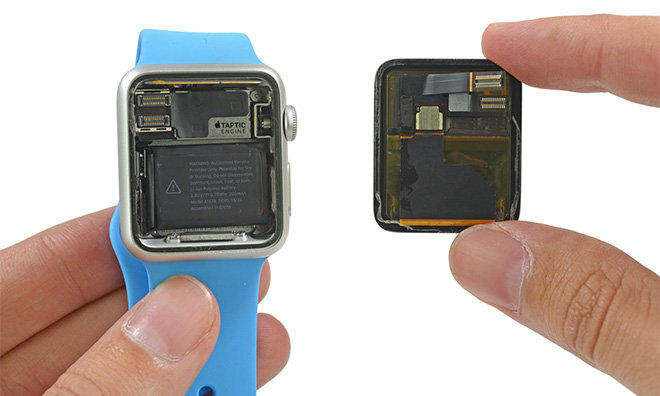 Just hours after Apple Watch first reached early-bird buyers in Australia, a device teardown hit the Web revealing a litany of miniature parts and an unannounced data port thought to be used for diagnostics work. As with every major Apple product launch, the team at iFixit dutifully began to tear down a 38mm Apple Watch Sport less than five hours after some of the first consumer units were delivered to Australian customers. The teardown is currently underway as of this writing, but so far the repair firm has managed to remove the display and pry out the 205mAh battery. Images show off the Digital Crown, Taptic Engine module and the enclosed case of Apple's S1 system-on-chip. Also seen is an unannounced data port hidden under a cover located in one of the strap attachment grooves. The data port's purpose is unknown, though a report in March claimed the six-pin connector is capable of transferring data and possibly power to Watch. Interestingly, an identical port can be found on the underside of Apple Store demo displays holding working Apple Watch units. As for repairability, iFixit found what it calls the "tiniest Tri-wing screws we've ever seen" holding component brackets in place. Along with specialized screws, Apple relied on adhesive material to keep everything in place, a space and cost saving technique used in other products like iPhone and iPad.